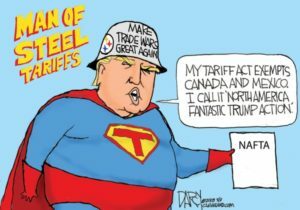 Canada needs to stand its ground in its ongoing tariff fight with the United States, witnesses from steel companies, manufacturers and the steelworkers union warned MPs Tuesday as President Donald Trump continued to hint there could be more hurt to come. A parade of expert witnesses at a special meeting of the House of Commons committee on international trade expressed solidarity with Canada’s array of retaliatory tariffs, slated to take effect Sunday, as they urged Ottawa to take steps to protect and support affected companies and workers. “We support the countermeasures announced by the federal government and believe that they must be comprehensive and immediate,” said Ken Neumann, the United Steelworkers union’s Canadian director. And he waved off the notion that Canada should avoid provoking Trump. “If you don’t poke the bear, he’s going to eat your lunch,” Neumann said.